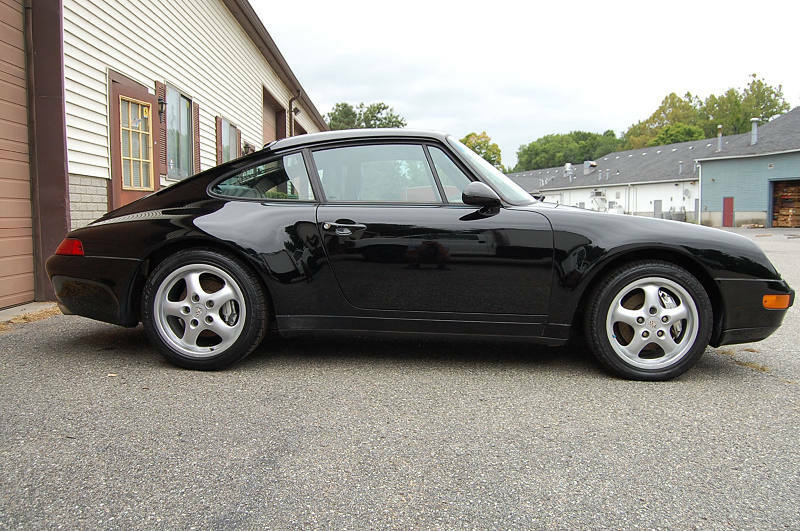 1996 Porsche 993 C-4 Coupe Triple black. Two owner car with 75,000 Miles. Clean car fax. This car has been sitting about 4 years, I purchased it from the second owner who bought the car on Augest 19 1998 with 5,051 Miles on it. He drove it up until about 4 years ago, when he told me he left the window open during a rain storm and the car got water in the interior and the computer boxes under the seat stopped working so he couldn’t start the car. When I purchased the car it was not running, I had a friend drain out the gas,and he looked the car over and did get the motor to turn over via the starter. He said it will need new computer boxes. The mice have been living on top of the motor. The car needs to be gone thru. The good news is that the car shows fairly well and it is a great color! It does have some chips on the nose and there is some rust on the lower bottom corner on the passenger side at the base and side of the windshield(see photo). The interior shows well and does not smell. The passenger side seat has split in the base and dash has some cracking on the pod over the instruments. The windows, lights and fan blowers come on and work. The sun roof works but the front flap sticks up. The car comes with full books, tool kit, air pump and spare. I do have the purchase order from when he got the car, I do not have any service records the dealer where he had service work done would not release them to me. The car rolls well. This is a very worthy project that with some work would be a great car to drive. These are one of my favorite cars, the last of the air cooled Porsche cars, not to refined so it is still fun, but easier to live with and you can drive this car everyday so you can really enjoy it.